Looking at classical Chinese furniture from the ‘Golden Age’, one will surely come across a wide range of designs utilising a broad variety of materials. There are lacquered examples as well as softwood, imperial and the hardwood types. The pieces represented here only indicate the classical styles in hardwood. The beauty of hardwood examples lies in its simplicity of form and intricate ornamentation. Simple forms coupled with predetermined design concepts led to the use of ingenious and complex joinery methods. 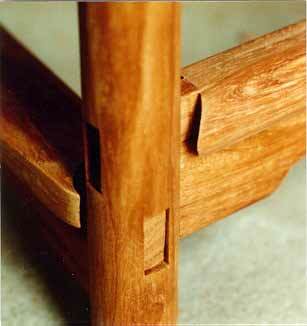 The intricacy of the joinery can be described as being puzzle-like. Because no dowels, nails, screws or similar fixtures are employed, the most common method of putting together furniture parts is by a system of complex mortise and tenon; sliding dovetail; pressure-pegged lapped joints, etc. With each type of joinery there are numerous combinations each suited for a particular purpose. For example, the mortise and tenon joint for connecting circular members at right angles requires the tenon member to have curved shoulders that fit onto the mortised member. 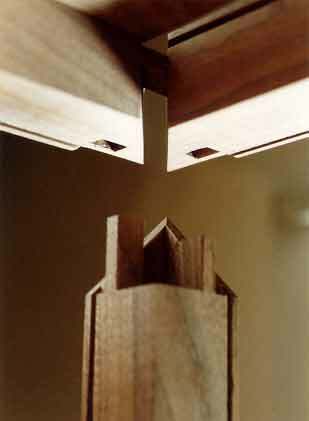 A mitred mortise and tenon is standard for framework but it poses a challenge to the artisan when it becomes a three corner member mitre mortise and tenon joint. The reader should note that where the contemporary furniture maker will emphasise a joint for aesthetics, the Chinese furniture maker will do the opposite and conceal most joints. Only the wood, its texture, ornamentation and form are emphasised. With this understanding we can appreciate the furniture from a totally different perspective, that is the world of hidden joinery.